293 Dd is not the form you're looking for?Search for another form here. Who needs a DD Form 293? What is DD Form 293 for? 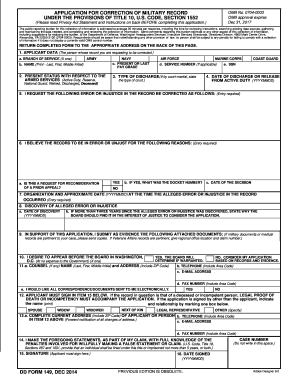 How do I fill out DD Form 293? DD Form 293 which is called Application for the Review of Discharge of Dismissal from the Armed Forces of the United States should be used by servicemen claiming for the military discharge upgrade. This form is to be reviewed by the appropriate military discharge board, and the decision on the request is to be taken. 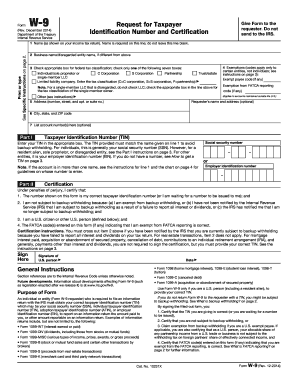 Information provided on this form is used to argue the current discharge status of the applicant. A serviceman should provide all the reasons why they think their discharge should be changed, why they believe that the discharge received was improper or inequitable. 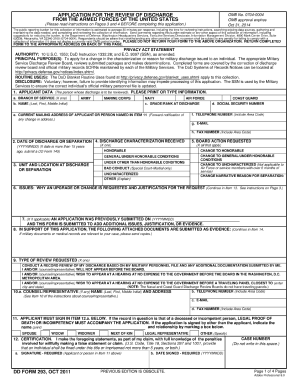 In order to avoid delays in consideration of the application and scheduling of the necessary review, the copies of applicant’s official military personnel file should be submitted before the submission of this form. Once completed and signed, this form should be directed to the appropriate office of the Department of Defence.